Ongoing deal, never expires. Last validated 7mo ago . Used 10 times. Marvz As of 08/31/18, I tested this promo code and verified that it works as described. Exclusions apply. Marvz As of 07/25/18, I tested this promo code and verified that it works as described. Exclusions apply. Marvz As of 01/06/18, I tested this promo code and verified that it works as described. Exclusions apply. Marvz As of 12/21/17, I tested this promo code and verified that it works as described. Excludes new items and sale. Marvz As of 12/12/17, I tested this promo code and verified that it works as described. Excludes new items and sale. Marvz As of 11/27/17, I tested this promo code and verified that it works as described. Excludes new items and sale. Marvz As of 11/18/17, I tested this promo code and verified that it works as described. Excludes new items and sale. Faarooq I have tried this PROMO CODE and VERIFIED that it's working as described. Exclusion Apply. luis g The code is valid. 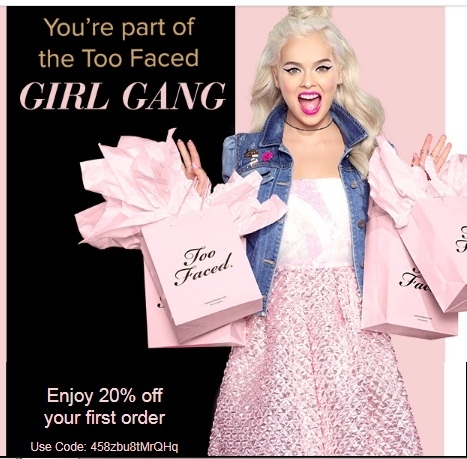 Good deal, add your item to cart, enter promo code and get 20% Off Your First Order at Too Faced Cosmetics.